Lucinda Helm was born in 1839, the daughter of John Larue Helm, a railroad president and governor of Kentucky. John Helm established the family seat near Elizabethtown, Kentucky, where his daughters lived out their lives. A brother, Ben Hardin Helm, was killed in the Civil War as a Confederate brigadier general. 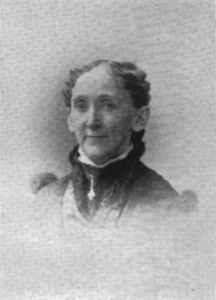 When the General Conference of 1886 set up a woman’s division of the Board of Church Extension, Lucinda Helm became its head. She had written its constitution. She agitated for the creation of a Woman’s Parsonage and Home Mission Society (WPHMS), and when the General Conference of 1890 authorized that, she was its first general secretary. She began publication of Our Homes, the official newspaper of the WPHMS. She mentored Belle Bennett, who became president of WPHMS in 1896. She died in office in 1897. Mary Helm, several years younger than her sister Lucinda, was an equally active churchwoman. She was corresponding secretary for the Louisville Conference Woman’s Foreign Missionary Society. For a time Lucinda and Mary were, respectively, the secretary of the Home Mission Society and assistant secretary of the Foreign Mission Society. Mary Helm succeeded her sister as editor of Our Homes, holding the post until 1910, when she resigned in protest over the merger of the women’s work in to the General Board of Missions. Both women are buried at the family home in Elizabethtown. Taken from Robert W. Sledge, “Five Dollars and Myself”: The History of Mission of the Methodist Episcopal Church, South, 1845-1939. (New York: General Board of Global Ministries, The United Methodist Church, 2005), p. 213.